A lot of people I know are incredibly lazy when it comes to sun care. I have dark skin, and therefore a lot of people assume that I don't need to protect myself from the sun. That is simply not true! Everyone who exposes themselves to UV rays are at risk for developing sun damage, fine lines and melanoma. My mom always says, "prevention is better than cure" and that is definitely true when it comes to sun care. Luckily, a lot of beauty companies also subscribe to this way of thinking and have found ways to incorporate SPF into their products. The products listed below are some of my favourite SPF items, but if you check you may just find out that your favourite companies incorporate SPF into your most used products! Clinique Long Wear Lipstick // I love these lipsticks! The colours are very neutral and perfect for everyday wear. Each lipstick has a SPF of 15, which is an added bonus and a really pretty way to protect your lips from the sun. Lips can definitely become burned and chapped from sun exposure. 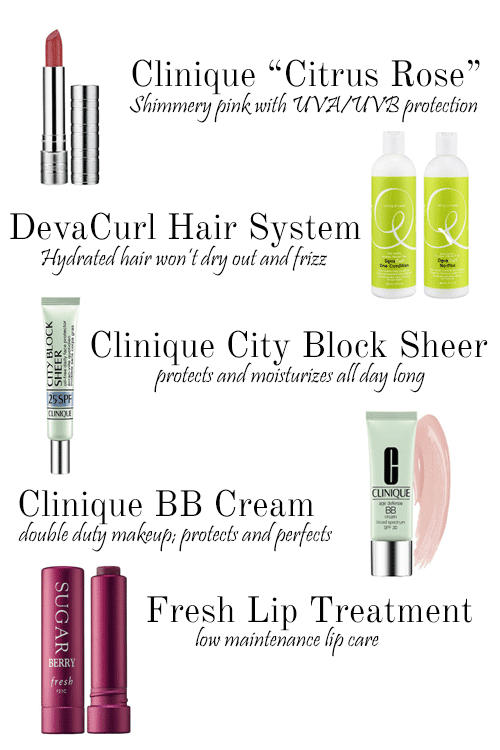 DevaCurl System // While these products don't have SPF; I still love them - especially the cleanser. Hair that isn't well hydrated is hair that gets frizzy and looks dry. With curly hair, I don't need to focus on shampooing as much as conditioning, so I employ a conditioning cleanser and follow up with a deep conditioner! There are some serums on the market with SPF - but I have yet to try those. Clinique City Block // One of my holy grail products. It moisturizes and stays put - and as an added bonus is a great makeup primer. This product's SPF goes up to 40, which is what I currently use! Clinique BB Cream // Another holy grail. I'm not a huge fan of foundation. I have dry, sensitive skin and I feel that foundation makes that problem more obvious and sometimes worse. I live by BB cremes. I've tried many and I would have to say that this is my favourite higher end BB cream (this drug store option is great too). After using the City Block to prime - this BB cream goes on like a dream and makes my skin look super even. Fresh 'Sugar' Lip Treatments // For days where I skip the lipstick, this balmy gloss works great and still carries the SPF I'm looking for! Very low maintenance. For all over sun care, I'm not fussy. This is a great option and this is a budget friendly option. Both don't have that sunscreen smell that I hate!